Do’s and Don’ts to Remember When Meeting a Blind Person. October isn’t just for wearing pink and Brest Cancer Awareness. It’s also Meet the Blind Month, so we’re accessorizing with canes, a positive attitude about blindness, and getting out there doing everyday things like everybody else. Here’s Marley with her long purple cane, and me with my long white cane as we leave Town Square after a fun story time and magic show before school today. 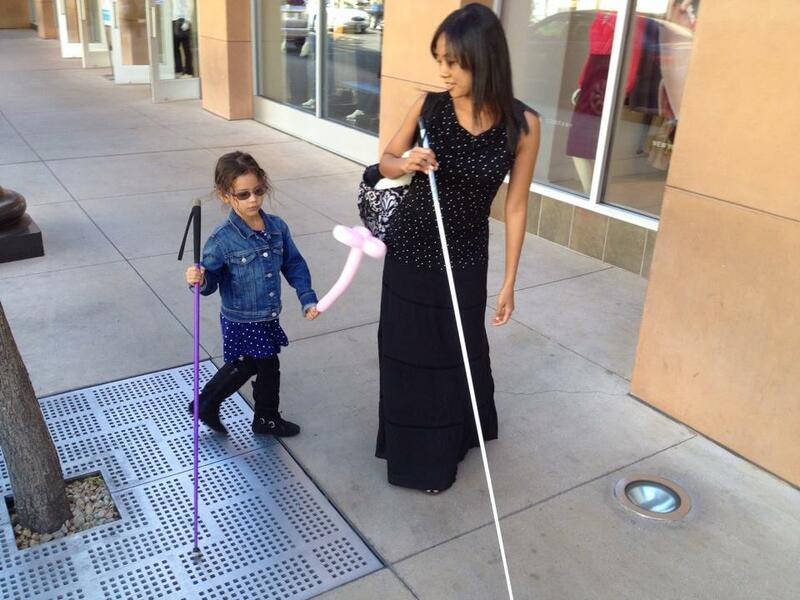 Here are just a few friendly reminders of do’s and don’ts when meeting a blind person. Do; say hello instead of standing around waiting for us to expect to know you’re there. Don’t; point when we are asking for directions, we are asking because we actually need directions. Do; ask if we might need assistance. Don’t; grab us by the arm and drag us to where you think we might be going or across the intersection. Do; ask us about our blindness if you are curious. We are more than happy to talk. Don’t; point and stare, jump over our canes, or pull your children across the street. Blindness isn’t a contagious disease. Do; tell us which bills are which when giving us change. Don’t; say, “Here are your bills, and here are your coins.” I think we can figure that one out for ourselves. Do; engage us in conversation. Some of us actually might have some pretty interesting, intelligent, or hilarious anecdotes to share. Don’t; yel or speak slowly to us. We are blind, not deaf. To my blind friends reading this who have your own do’s and don’ts to share, please feel free to comment below. I’d love to hear from you. Posted on October 1, 2014 by MamaRupp	• This entry was posted in Uncategorized and tagged attitude, Blind, blindess, Canes, Do's, Don'ts, Meet, Month, Positive. Bookmark the permalink. Hehehehe. I have a ton more to add. Don’t: Grab mobility devices while we are using them. Or ever really. It only makes things worse. Dont: Stand there with the door open in silence like we will actually see you offering such a kind gesture. Do: Speak to a blind person directly. These are awesome/ Thanks for sharing Danielle. Do: At gatherings, let the blind person know when a group is migrating. Do: Announce your arrival AND departure. Do: if we are eating, and don’t know what food is where on the plate, explain which food is placed where. Do: treat us like human beings. Just because our vision isn’t as good, does not mean that you are allowed to talk down to us as if we are dogs that don’t understand what you are saying. Don’t: whisper across the way about “that blind person over there”. Our hearing is better then you’d think, we can tell what you just said. These are some of my personal experiences that I have dealt with. If you are a college student, taking a course from a blind instructor, don’t assume that he or she will be an easy grader, that you can blow off assignments, or that you won’t learn much in the course. very true. Thank you. May i post it on my web site, after translating it in Russian ? Yes, of course! Sharing is caring. Vadim, please make sure to give credit where credit it due. Don’t, stop talking to your friends as you stare with jaws agape at the blind person navigating. This will make you a target and there will be great embarrassment and perhaps a thwacked foot or ankle. Do: feel free to ask about my guide dog. Don’t: Touch any guide dog while they are working which means when ever they need to be wearing their harness. If you’re not sure if it’s appropriate to pet them or not please ask. Do: Treat us just like anyone else, just because we are neighbors lines not mean we are fragile or treated with kid gloves. We have our Ups and downs in life just like everybody else. One of my daughters major complaints was when people would ask me questions about her well being when she was next to me. It used to irritate her very much. We used to say hey she can answer that and they would go silent. So I want to remind everyone speak directly to a blind person. A lot of blind people are very smart and interesting. Also drivers take notice to the white cane. Respect the pedestrian walkway, don’t place your car in the center of the walkway and do not use hand signals telling a blind person to go ahead and cross. They can’t see you. Where did you buy those white canes? Where can i get them? How much are those? It’s a real pleasure to read your list of do’s and don’t. I’ve had a few crazy experiences myself. It’ seems many believe a lack of vision equates to having a lower intelligence level, and yes, speaking louder and pointing is soooo helpful—NOT!